This lesson is intended for students to use the story, Colleen and Leprechaun, from the Reading A to Z website. 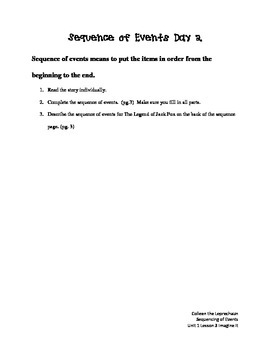 Sequence of Events relates to the Imagine It Reading series for 2nd grade for Unit 1 Lesson 3. Colleen and the Leprechaun is level N. You will need a username and password in order to access the book and the extra sheets to include with the packet. Behind each page is one of the worksheets provided by Reading A to Z. I am unable to attached the worksheets to this packet due to copyright. I use this book with my high level students in 2nd grade to help increase their MAP scores. 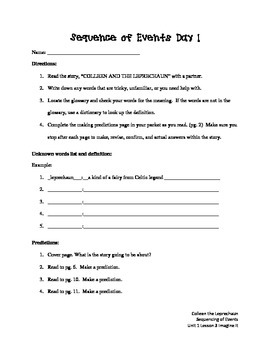 Each packet contains a reading strategy page, a grammar page, and/or a creation page.